At long last Ramadan is here and everyone in our house is excited by its arrival. After all, so much has been built up about Ramadan in the six months that we’ve been here. It seems ever since arriving in Dubai people have gone out of their way to tell us about the holy month– warn us is actually the more accurate term. 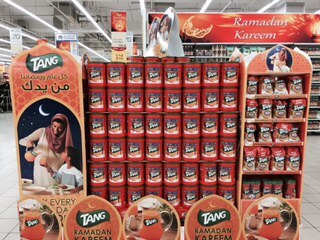 Expats, in particular, seem to take a certain pleasure in detailing all of the ways Ramadan can dampen the Dubai life. There are so many rules, they cautioned. And it’s true, during Ramadan there are many rules in which we must abide by including: no eating, no drinking, no smoking in public during the daytime; no loud music, no chewing gum, no wearing tight or suggestive clothing (I think I’m safe), no ‘speaking ill’ about others (e.g. gossiping or salacious language); and, perhaps not surprisingly, no public displays of affection. So it’s understandable that as a non-Muslin and new resident I felt intimidated by Ramadan. I was consumed with worry about how we’d get on with our lives. The thought of staying hydrated in 100+ degree heat without the safety of even a water bottle had me in a panic. Plus, I wasn’t sure how I would keep two kids entertained indoors when most everything is closed—that means no stopping off for a quick ice cream or an afternoon pick me up. From here on out it would have to be point-to-point travel only, and so I would plan our days with military precision and grit. But then one morning as I was driving in the car listening to the Cultural Affairs Minister on the radio, it suddenly hit me. He was explaining the meaning of Ramadan and why the eating/drinking ban exists in the UAE. He said that Ramadan is all about reflection, about self-control and about appreciating life through personal sacrifice. The rules exist not to trap or hamper foreigners, but rather to create a community-like atmosphere where everybody supports everybody in their collective efforts to fast and abstain. And it was then that I realized, mine wasn’t a problem of logistics or practicality. Not really. Mine was a problem of perspective, of empathy– or lack of it. One of the reasons we came to the UAE was so that our family could gain a greater cultural understanding for this part of the world. And unfolding before us was the single most important holiday of the year in the Gulf. Sure, day-to-day life would be different and confusing and slightly uncomfortable. But so is living abroad. So instead of hiding under the duvet or high tailing it back to the States, I’m taking this opportunity to learn about and embrace one of the most fascinating aspects about living in the UAE. Without question fasting during Ramadan– the abstaining from food and water for 30 days from dawn until dusk– is an incredible challenge of the body and mind. In an act of solidarity for our new compatriots, Justin and I are attempting to fast. It’s Day 1 and already horribly painful— I broke down midday and ate bread while Justin has remained steadfast. But despite how disciplined– or undisciplined– I am, I’ve already gained a heightened sensitivity to those around me. I’m constantly thinking about the people that must endure this kind of lifestyle not by choice but, sadly, by necessity. These are important lessons to be gained regardless of your religion, culture or location in the world. 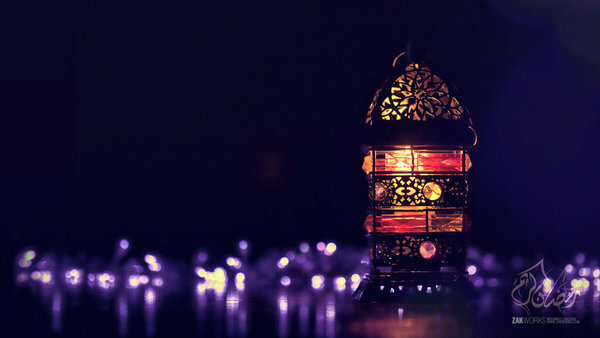 One reader in The National recounted how to her Ramadan “is the month to purify the soul…an opportunity for detachment from the world and for deep reflection and thought.” I hear this sentiment a lot. In fact, one Emirati father whose son is in class with our younger son described how Ramadan is the perfect time for him to take stock of his personal and professional life. Each year he and his family reflect on their accomplishments and lay out their goals for not just the coming year but the following five years. But Ramadan is not just about fasting and prayer. There are celebrations that are enjoyed when the sun goes down- Ifthar and Suhour dinners– and those fasting get together with family and friends to break bread and celebrate life. It’s a beautiful time of day and I find myself a bit envious about how we Westerners only have the one-shot holidays (e.g. Christmas, Thanksgiving, etc) while here they have 30! Which means people have one whole glorious month to cook, eat, dine out and generally enjoy the company of family and friends. Not such a bad deal, if you ask me. Like the UAE, these countries see a high number of tourists in the summer months, and I’m guessing some will choose to bypass the UAE out of a perceived fear of being inconvenienced. Which is a shame, as the holy month can be a once in a lifetime experience. I applaud the UAE for sticking by their beliefs and for creating a system where everyone supports one another. What would it say about our community if Suzy Expat is sitting eating a Shake Shack burger out in the open while her neighbor struggles to make it through the day without food? Does that really help foster a communal spirit, a ‘we’re all in this together’ attitude? And so I agree with the Minister when he says Ramadan and fasting is deserving of the entire community’s support, and that is why the rules are the way they are. To me, feeling a slight pinch makes me more invested in everyone’s success and also more empathetic, which is really the point of Ramadan after all. My hairdresser once told me that he loves being in Dubai during Ramadan because of the ‘spiritualness’ that is felt around the city. There’s a palpable energy that only surfaces at this time of year. 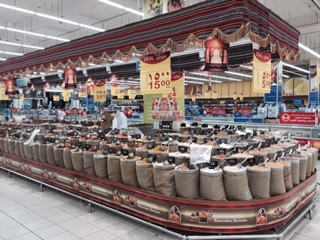 I can see it forming already– holiday cards with well wishes are circulated, restaurants encourage diners to celebrate Ifthar with grand buffets and heavy discounts, stores display mountains of holiday foods such as dates, jams, cakes and other specialties. And it’s nice to hear on the news a break from the usual horrors and instead stories about the many charitable acts occurring around the UAE, where food and water are delivered to the poor and even prisoners are set free. It’s truly thrilling to be at the center of such a hugely important event and to have our eyes opened to a whole new way of life. I’m guessing it’s the same excitement one might feel when experiencing Easter at the Vatican or Chinese New Year in Hong Kong. The spirit of Ramadan is everywhere and I feel lucky to be here and experience it. A happy Ramadan Kareem to you. Last week the UAE registered as the hottest place on Earth. According to the National Centre of Meteorology and Seismology, it reached a whopping 50.5 degrees in Abu Dhabi last Tuesday (that’s 122.9 degree Fahrenheit!) and was recorded as the highest daytime temperature on the planet for that day. Normally I hate talking about the weather. It’s the one topic that will either unify or bore the hell out of us UAE residents, and I stand in the latter camp. Because, honestly, what is there to say? Yes, it’s hot. It’s miserably hot. And no, you can’t really go outside unless you want to know what it’s like to cheat death every time you cross a parking lot. But what’s so interesting about that? 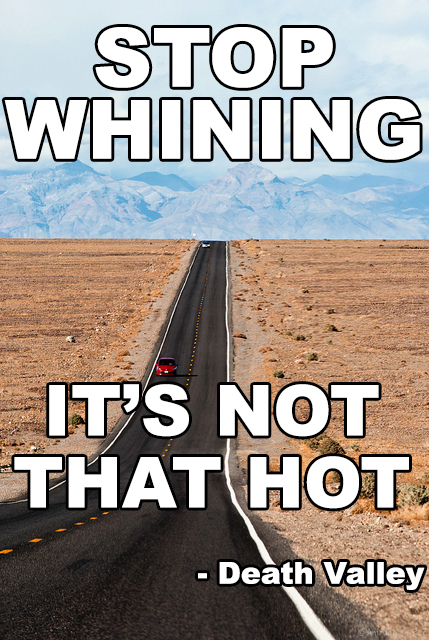 I’ve tried to avoid talking about the heat for the sheer fact that I’ve exhausted my lexicon for how to describe something that just feels—well, hot. That and the wistful, delusional notion that if I ignore the topic then perhaps the very thing itself will disappear. As if. But last week called for an exception to the rule. In my sheer amazement with the temperature I nearly expected life to come to a screeching halt instead of insistently marching on in 120+ degree heat. It forced me to accept the simple fact that our life here in Dubai– and therefore our happiness—is greatly affected by the weather. There could be no denying that every aspect of life is impacted by the hot, from the daily mechanics of having to carry on with school and jobs to our mental health to the overall zeitgeist of the city. So rather than dismiss the topic entirely as I’d like to do, it’s time to call out the elephant in the room and take a hard look at life in 122 degrees. There’s no question that one feels a physical response to weather like this. It depletes you and leaves you gasping for air, your energy having just vaporized the second you get out of your car. For awhile I was finding myself completely and utterly exhausted in the afternoons. I would take the kids to school in the morning and then if I wasn’t writing (which was often) I would run a couple of errands or—on those rare, triumphant days—hit the gym. But by the time I picked up the kids midday and drove back home, it took every ounce of stamina I had not to crawl back into bed. I was inexplicably fatigued and I’d turn to a trusty cappuccino (or three) to get me through the rest of the day. My first reaction was that I wasn’t eating properly. So I cut out the carbs and refined sugars (not exactly easy considering the UAE’s obsession with sweets) and tried to load up on fruits and anything green. But then I became tired and hungry which, when you’re parenting late in the day, is a horrible combination that had me bordering on some Mommy Dearest behavior. I went back to the caffeine. I contemplated my sleep, wondering if I should go to bed earlier or if getting an hour or two more/less would make the difference. But no matter how I adjusted myself, I arrived in the afternoons feeling the same. It then became apparent that it really was the weather. That even though my routine wasn’t necessarily physically exerting, the act of doing even the simplest of tasks became unbearable in this heat. I wanted to turn into a Bedouin and sleep under a tent all day (albeit an air-conditioned one) and not make contact with the world until sundown. It suddenly made sense why this part of the world shuts down in the summer—you simply can’t physically function. Just this morning I heard on the radio about a study in Holland that found that higher temperatures make people more depressed and to act more aggressively. [Not particularly reassuring news for an already volatile part of the world.] They also found that seasonal affective disorder (SAD) is a very real condition that can affect people not just in the winter months, as commonly thought, but also during extreme high temperatures in the summer. Sure, we all were feeling slightly grumpier for having to make certain adjustments for the heat. But could it really impact our psyche??? “I spent the whole weekend bickering with my husband, and I swear it was the heat,” one of my friends told me. After six years here she still dreaded the summers as they constantly “put her on edge.” I, too, noticed a collective irritability in the city. People drove faster and were less accommodating on the road because sitting in traffic, even with the AC, became intolerable. I found myself trying to avoid lingering outside of class after pick up and instead chased my kids to the car with the vengeance of a lion tamer. Weekends could no longer unfold at our leisure but required scheduling as the heat dictated when we could swim, go to the beach, BBQ or entertain guests. And too much time inside had us resorting to iPads and endless snacking, and wore down my already razor-thin patience. I felt anxious and ached for the evenings where we could leave the windows open and fall asleep to a breeze instead of the din of the AC. On the other hand, there were moments when I was amazed at how much we’d acclimated already. Several mornings I’d check my phone and decide that 90 degrees is an acceptable temperature in which to go for a jog. Or I’d contemplate slipping on a pair of jeans (although I still can’t bring myself to do it despite the fact that a shockingly high number of people do.) Instead, I’ll wear pants or long sleeves and feel perfectly comfortable just as long as the material is like something the astronauts wear—white, wrinkle-free and made to dry the sweat off your back in 30 seconds. Last week we had some friends from back home come to visit and they had the bad fortune of coming to Dubai from Dublin. This poor family arrived totally unprepared for the crushing heat (although in fairness how one can adequately prepare for this kind of weather is truly a mystery). Instead of getting out and about sightseeing, they found themselves in a semi-debilitated state and spend the week either poolside or inside their hotel lobby. 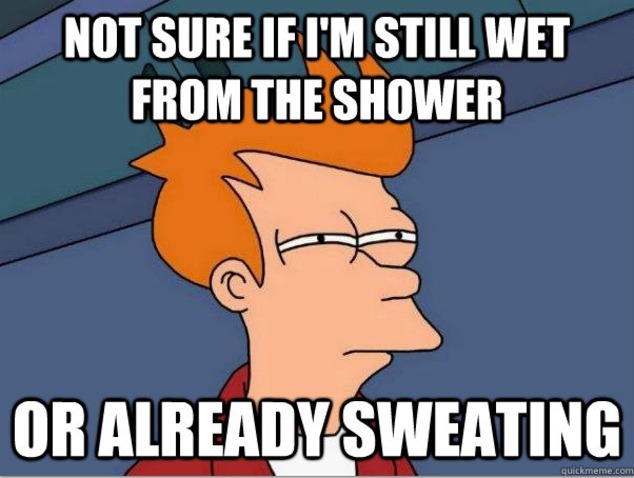 Most of the time I try not to think about the heat, or at least pretend that I’m impenetrable in my AC-powered cocoon. But then the stories trickle in from India about a heat wave that has taken hundreds of lives—with temperatures only slightly higher than the reading in my car—and I suddenly feel the fragility of our lives hanging by the mercury. Ok, maybe that’s an exaggeration but I do often think that my survival is entirely attributable to a small box with vents that lives in my ceiling. And I try not to think about the possibility of a blackout, because as romantic as it was in New York the prospect of it occurring here is utterly terrifying and has me wishing for a plan where we’re airlifted out of the country. Please god, don’t let the electricity burn out! Our escape home is only a few weeks away, and already I feel enlivened by the idea that soon I won’t have to worry about sunscreen or big hats or never-ending afternoons indoors. Bring on the fog! Oh, please, San Francisco don’t disappoint me because I’m looking forward to this summer being the coldest winter I’ve ever spent.